Inspect what you expect. I can’t remember which management guru put that in my head, but next week take a moment and review a project you’ve assigned. In detail. As the robots continue to make remembering facts and finding information easier, a premium will be put on communicating. While you inspect what you expect, note the gaps and ask yourself how they could have been avoided with a different communication approach. Tying better communication to options, the more distinct the options offered, the more effective they are at moving a decision forward. Do you use testimonials to help your business development efforts? This idea will help your prospects make better decisions by matching the testimonial to where your person or people are in their decision process. 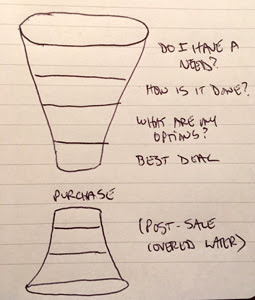 First, your prospect has a vague sense of a need and investigates solutions by asking “how are others like me solving this problem?” Those first two parts of the funnel are a high level abstraction used to orient themselves. Once oriented, they can start narrowing the options to the best one for them. Once an option has been selected, they can reduce the risk by negotiating a deal that makes sense for them. That leads to a purchase and the post-sale funnel which I’ll cover some other time. Now, read through your testimonials and fit them into your people’s decision process. Where do most of them fit? I find that most testimonials fit into the bottom end of the funnel. For that reason, in lead generation, we focus on adding some early stage testimonials to the sales process. That does two things for us. First, it gives you a client’s natural language to decribe a decision process that matches where future clients are hanging out. Second, it gives you insight into your clients decision making process. Match the testimonial to the decision stage. Get testimonials about the earliest part of the decision process by asking clients to step back in time. This winter, the Super Bowl will be held in Minneapolis, MN. Average temperature on February 4th in the Twin Cities? 23 degrees. That’s the high. The average low is 7. Talking to a woman who is one of the volunteers for the event (one of the Crew 52) she mentioned all of the regular winter festivals in the Twin Cities have been pushed to the weeks before the big event. Lots of fun in the cold. The thought of it reminds me of the time I was way up nort’ in the dark part of winter and our hosts said, “let’s go have a campfire.” It was frigid. The sun was only going to be out for a few hours. It sounded delusional, but we went along, set up a giant bonfire and played in the snow. It was a riot and I said something to that effect.